All of the pre-season testing has been done, all of the driver moves have been completed, the new teams have been announced and what new liveries there are have been unveiled. It’s time to go racing. 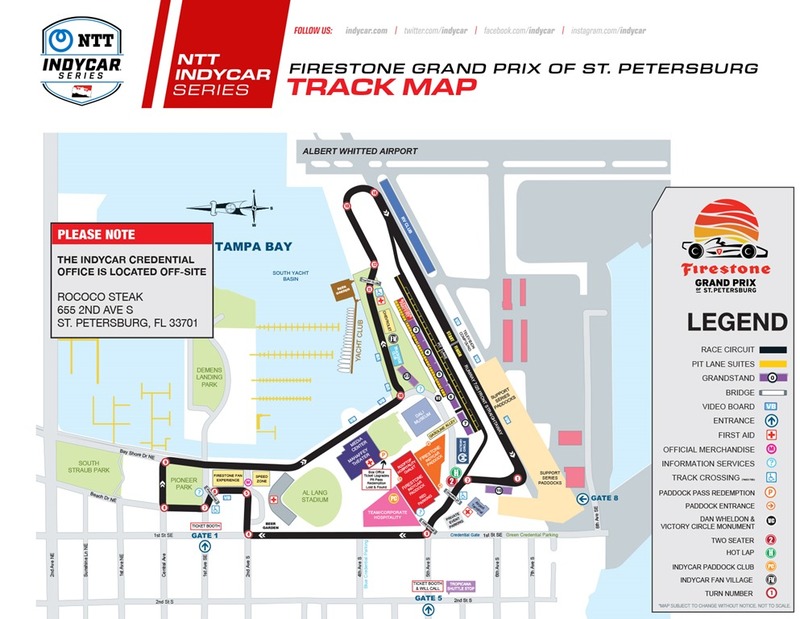 As you read this, Susan and I should be on our way to the temporary street circuit that makes up the Firestone Grand Prix of St. Petersburg. We flew down last night after work and our flight arrived in Tampa around 8:30 local time – losing an hour to the time change. With Daylight Saving Time going into effect on Sunday, does that mean that hour is forever lost or do we get it back on Monday when we return to Central time? It’s too confusing. Anyway, once we got our bags, rented our car and drove down to our hotel in the St. Petersburg area (we are staying in Treasure Island, just due west of the track) – it was about 10:30 pm. not to sound like I’m gloating, but I’m ready for warm weather. We’ve had temperatures in the teens most mornings this week in Nashville. Thursday morning was a heat wave – it was twenty-six degrees. So I say should because we may be sleeping in just a bit and not be moving as quickly as I’d like, but we’ll get there. The first practice this morning will be at 10:45 am local time and will be carried exclusively on NBC Sports Gold. If you haven’t ponied up the $50 for access all year, you can still do it at that price. On Sunday, it increases to $55. This afternoon’s practice will be at 2:45 pm. Practice Three will be tomorrow morning at 10:15 am, and qualifying will be shown live at 2:30 pm EST on NBCSN. Sunday’s race coverage starts at 12:30 pm on NBCSN with a one-hour pre-race show, and the race starts at 1:30 pm. Compared to the weather we left behind earlier this week, the weather here could not be better. There is only a 10% chance of rain each day we are here, and the forecast is for mostly sunny skies each day with a high of between 78° and 80° each day. This will be our first time ever at a temporary street circuit. I’ve always been curious about how well you can actually see the track, considering all of the concrete barriers and temporary fencing there is. I’ve spent the last couple of weekends watching old races from St. Petersburg on You Tube, just trying to get some sense of the lay of the land. It’s been my experience that you really can’t do that until you’ve actually been there and gotten your bearings yourself. But from what I can tell, it’s almost two distinctly different circuits. A lap begins on Runway 25 at the Albert Whitted Airport, which serves as the main straightaway. Pit Lane and the main grandstands are alongside the main straightaway. The cars are able to spread out on the wide runway, but they must funnel down to no more than two-wide when going through Turn One. Turns Two and Three have proven to be trickier than they appear to us fans. Many a driver’s day has ended through that set of turns over the years. Then there is a straight down to Turn Four, a ninety-degree right-hander and then another ninety-degrees back to the left in Turn Five, followed by another left-hander for Turn Six. Turns Seven, Eight and Nine are a series of right-handers. Quite honestly, this whole part of the circuit bores me. It’s just a lot of slow zig-zagging that seems to heavily discourage passing. But coming out of Turn Nine, things get very interesting. With Tampa Bay to the driver’s left and the yachts docked in the bay just beyond the track, it makes for a perfect backdrop as the track suddenly opens up. This is the racy part of the circuit. The cars quickly gather speed as they race down to Turn Ten and make the tricky left-hander onto Dan Wheldon Way. From there, they navigate a series of minor turns before hitting the right-handed hairpin that takes them back onto Runway 25 for another lap. I don’t know if the racing at St. Petersburg is really that good, or we’re just so starved for racing at that point that anything looks good to us. But there have been many memorable moments at St. Petersburg. When the IRL first ran this course in 2005, it was the first time ever that the IRL cars had ever turned right. If you’ll recall, the Indy Racing League was originally founded as an oval-only series. The four cars of Andretti-Green Racing finished the race 1-2-3-4, with Dan Wheldon taking the win, followed by Tony Kanaan, Dario Franchitti and Bryan Herta. Following the unification in 2008, Graham Rahal did not run the opening race at Homestead. His Newman/Haas team felt he and his car were not ready. So the nineteen year-old Rahal made his IndyCar debut at the second race in St. Petersburg. He ran well all day and at the end, outran veteran Helio Castroneves to take an emotional win in his very first IndyCar race. In 2016, Will Power crashed in qualifying and had to miss the season-opening race – putting him in a hole he never recovered from. In 2017, Sébastien Bourdais crashed in qualifying and had to start from the rear of the field. Through excellent driving and a little luck from well-timed yellows, Bourdais worked his way to the front and won the race. After coming back from his massive injuries suffered at Indianapolis in May of 2017, Bourdais cemented his comeback by repeating his win in 2018. But the win by Bourdais is not what everyone remembers about last year’s race at St. Petersburg. It was the dominant performance by rookie Robert Wickens who was driving in his very first IndyCar race. He won the pole and led most of the laps. He appeared to be cruising to victory when there was one more restart. Alexander Rossi got a good jump on Wickens at the restart. They were in a drag race going down the main straightaway, when Rossi dove to the inside. He slid as he was gong too fast through the corner, sliding into Wickens and thereby taking Wickens out as Rossi kept going. However, Bourdais was sitting in third and Graham Rahal was in fourth. They both pounced as the two leaders in front of them made contact. Rossi finished on the podium in third, while a dejected Wickens climbed out of his car and had to settle for eighteenth. While this race can be very entertaining, it should be noted that it does not serve as a very accurate barometer on the season. Since the NTT IndyCar Series first began running at St. Petersburg in 2005, the winner of the race has gone on to win the championship that season only three times – Dan Wheldon in 2005, Dario Franchitti in 2011 and Will Power in 2014. It has been four if you figure in Paul Tracy, who won in 2003 – the only year that CART/Champ Car ran at St. Petersburg. My record for picking winners on this site has been so abysmal over the years, the only reason I continue to make picks is that I figure the law of averages will catch up at some point. Normally when pick a driver to win a race, that driver usually wads up the car very early in the race. Let’s hope my luck changes in 2019 – just for the driver’s sake. So who will win the Firestone Grand Prix of St. Petersburg on Sunday? My pick is going to try and finish his unfinished business from last year – Alexander Rossi. We’ll see. As usual when we travel to races, we will be posting here throughout the weekend. I’ll post later this morning once we get settled at the track, and I’ll have another end of the day wrap-up. Susan will also have a post up here at some point during the weekend, so check back often throughout the race weekend. For more instantaneous photos, videos and comments; be sure and follow us on Twitter. You can follow me at @Oilpressureblog and you can follow Susan at @MrsOilpressure. Please check back often. This entry was posted on March 8, 2019 at 4:03 am and is filed under IndyCar. You can follow any responses to this entry through the RSS 2.0 feed. You can leave a response, or trackback from your own site. Dammit, why’d you have to pick Rossi?! 😦 haha So glad racing season is back and it’s a really nice bonus to have our favorite blog on-site to give reports from the track. Hope you both have a great time, looking forward to your photos and insight!